“Did you wet the bed?” I asked. “Well, it feels like it’s wet,” I said. 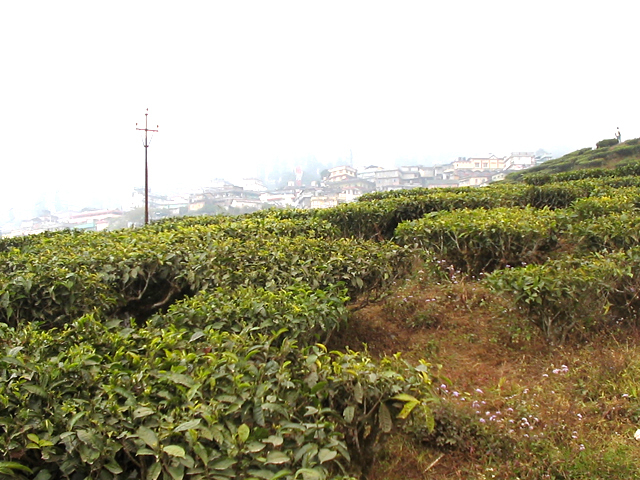 We were in Darjeeling, India for the week between Christmas and New Years day. High up in the mountains where the British used to go to escape the heat in the summer, it was now freezing. The fog was thick and the sun hadn’t peeked through the clouds for a whole week. 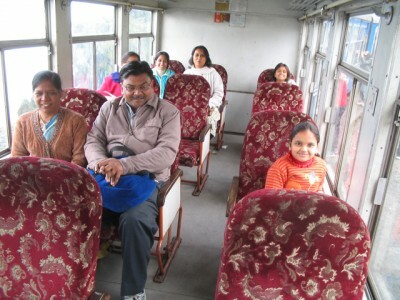 We had left Kolkata by train and traveled high up into the mountains. The train stopped south of our destination and we had to rent a taxi to get to Darjeeling. During the time of the British occupation, they would travel with Sherpas and a horse train. There is also a “toy train” with narrow gauge tracks, but it is now only a tourist attraction. One of the reasons the British had problems in India was because there were up to seven different sized train tracks. At each border, a train would have to be unloaded, then the loads put on another train for that area. Or the train car would be moved to another base of wheels. The toy train to Darjeeling is the only one left in service at this time; however, we would have had to make reservations several months in advance. On the way up the mountain, we stopped the taxi and examined the train as it sat waiting to fill. There is no glass in any of the windows, and knowing how cold it can get, I was just as glad to take a taxi up and back. We were now in a cute little hotel owned by a Tibetan family which had managed to escape before the Communist regime had closed off avenues of freedom. We paid extra for a little heater which was glowing red but didn’t give off much heat. We never turned it off for the whole week, and the best that can be said of it was that there were no icicles in the room. This would have been a perfect honeymoon hotel, as it was so cold, the only comfortable place was in the bed. The hotel provided each room with hot water bottles every night, and this night, one of them was leaking. By the time we found out, our bed was wet. Fortunately, the bed was large enough that we could keep our feet out of the moisture. One of the unique things to see in this area of the world is the prayer flags hanging from roofs or little towers. As the wind blows and the flags flip back and forth, the prayers are sent on their way, carried by the wind, to the heavens. There are many small temples all the way up and down the mountains, sending prayers for the inhabitants. This area is well known for the tea that grows on the hills. As we passed, we could see people walking among the plants, picking the new growth and putting it into large bags which are slung across their shoulders. The tea is then fermented before drying. We stopped to buy some for Ted’s daughter. Out in the street, Sherpas walked around with rubber sandals or flip flops and no socks. They are a short people, but have unbelievable strength. 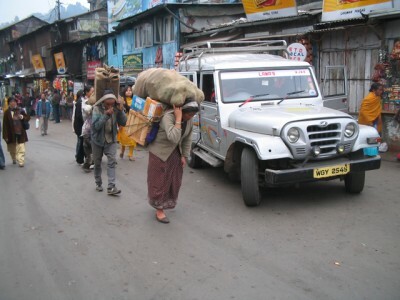 We saw them haul heavy loads on their backs up and down the mountain, most bent over with the weight of the load. We watched as one carried two heavy propane gas cans up the street. Little Sherpa women hauled heavy bags up the streets and when I say up, I mean UP. In all our days there, I don’t think we saw a single level street. A couple of the streets had a short level spot which quickly filled with stalls. The streets criss- crossed, up and down. We saw a small knot of people huddled around a little bonfire in the middle of the road, and we stopped and talked with them. 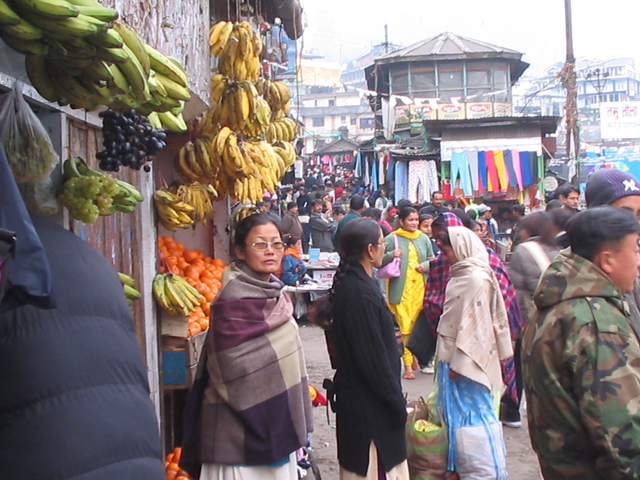 Many people in India speak English, a hold-over from the days when Britain ruled this land. Everyone was very friendly and enjoyed talking to the tourists. At one crossroad, we saw a group of dogs sleeping on the smoking coals from a dead fire. The stalls here were filled with furs and knit items. Lovely sweaters and thick mittens hung from every stall, even the stalls selling food or firewood. I bought a pair of gloves which I still have. I would have liked to buy more but without a personal Sherpa to carry my belongings, I didn’t dare. We woke each morning, hoping to see the Himalayas, but the fog was too thick. Most days you couldn’t see more than half a block. One morning, I pushed back the curtains and saw a brilliant bright day. Rushing to dress, we headed up to the view point where, on the rare clear days, Everest was visible. We snapped our photos and within half an hour, watched as the fog moved down and blotted the sight of that great mountain range from us. 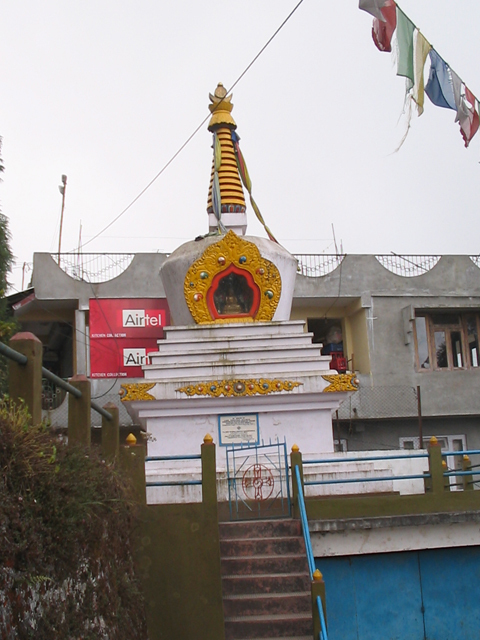 In Darjeeling, there is a museum dedicated to Mt. Everest and those who have made it to the top. It was interesting to see the equipment that had been used the first time. At the time of our visit, hundreds of people try to make it every summer, and it is increasingly important—and difficult—to keep the garbage off the trail. Back at the hotel, the on-site restaurant was more Tibetan than Indian. Our hosts offered one meal every night, more like a family service. We met a wonderful lady from England who usually traveled to Thailand every winter, but this year tried something new. 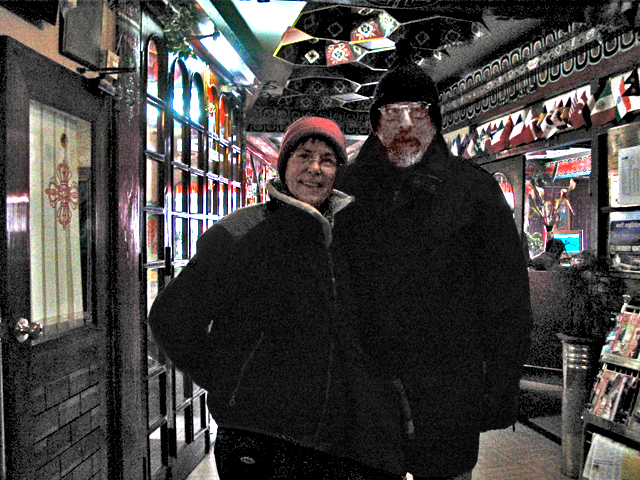 The restaurant was on the ground floor of the building and the walls were covered with Chinese motifs plus photos of the family and relatives from the home they left in Tibet. Too soon it was time to return to Kolkata and continue on our travels. We had a chance to see Mt. Everest and the Himalayas. 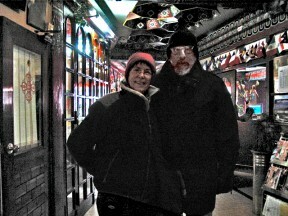 We tasted Tibetan food, warmed our hands over a street bonfire and made a new friend who would correspond with us for years. We walked along the streets of the fabled Darjeeling. We saw a few tea plantations and marveled at the prayer wheels, watched as the Sherpa hauled all sorts of items up to the houses and buildings. I was just as glad to have seen it during winter as everyone told us it was crowded in summer. By summer, we would be living in Kenya. My, you have had so many marvelous adventures. I can’t imagine going to all those places. What great memories. Thanks for sharing some of them with us. You say this is winter and not crowded??? sure looks crowded to me. Maria another Interesting travel story. I really look forward to them. Thank you my dear friend! Another good adventure, Maria. I really enjoy reading about them. Great story, Maria. I truly hope you’ll publish a collection of these travel pieces one day. I’ll bet many of your readers, not just me, would love to peruse such a book. Thanks for this. Dear María, What an exciting life and travéls you share with us. Qué envidia de la “buena!” I look forward to the book of ALL your travels.